Though a commonly used term, people often see cholesterol as an illness. It's widely circulated news that cholesterol is blindly removed from the 'naughty list' of foods, and that egg, butter, dairy products, nuts, coconut oil and meat are safe. According to an article published in The New England Journal of Medicine in 2017, a study in Denmark analysed that parents who had stopped taking statins after reading such news had increased incidence of heart attacks and brain stokes, increasing the number of deaths. That had put all speculations of cholesterol being healthy to rest. However cholesterol isn't all bad; there is good cholesterol, high-density lipoproteins (HDL) and bad cholesterol (Total/low-density lipoproteins or LDL). Cholesterol is a fatty material that is present in all of our cells and has few positive roles, such as helping make cells and their biochemical reactions. These lipoproteins carry cholesterol throughout the body, delivering it to different organs and tissues. But if the body has more LDL cholesterol than it requires, the excess keeps circulating in the blood. Over time, this type of cholesterol can enter the blood vessel walls and start to build up under the vessel lining. 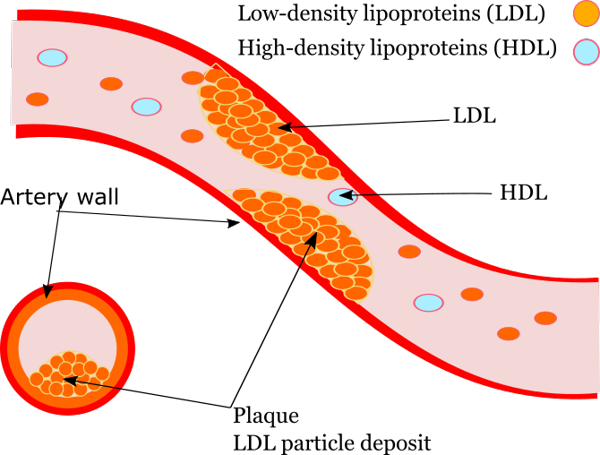 Deposits of these cholesterol particles within the vessel walls are called plaques, and blood vessels become narrow and can block blood flow causing coronary artery disease (atherosclerosis). This is why LDL cholesterol is often referred to as 'bad' cholesterol. HDL, also known as 'good' cholesterol, acts as cholesterol scavengers, picking up excess cholesterol in the blood and taking it back to the liver where it is broken down. This helps prevent the fat from oxidising and building up on the walls of the blood vessels. The higher the HDL levels, the better protected are the organs. Blood test which measures these fats or lipids is known as lipid profile. Recent guidelines by the American Endocrinology and Cardiology Society have stated that the levels of LDL should be less than 50 in patients with a history of heart attacks, stents, or by-pass. Both genetics and the lifestyle play an important role in your cholesterol levels. Indians peculiarly have low HDL levels. Some people may naturally be predisposed to low HDL and they may also have a harder time increasing a low number by diet and exercise alone. Doctors may prescribe medication such as Fibrates or Niacin. There are certain habits like smoking, taking steroids, eating foods with trans fats, being inactive or obese that can pull a low number further down. Appropriate body mass index (ratio of weight and height) can help control high cholesterol, especially LDLs. But weight loss from dieting alone can cause HDLs to drop along with the LDLs. Exercise has a powerful, but a short-lived effect. Each workout may result in a subtle HDL boost, and this is why it needs to be consistent.